A product’s packaging speaks volumes about a brand and what’s inside. Well-executed packaging communicates to consumers why a product and brand are unique. Designed to turn consumer’s heads, Honest Tea’s Summer Refreshers product line delivers on that mission flawlessly with its striking design. 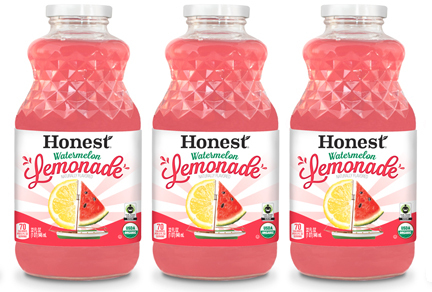 Honest Tea’s Summer Refreshers Watermelon Lemonade was recently awarded Silver in the Liquid Refreshment category of the Global Packaging Design Awards, sponsored by Beverage World. Entries were judged based on graphic design, innovation and structural design. The eye-catching pink liquid, apparent through the 32 ounce glass bottle, draws you into this package, while the label design highlights the fresh-tasting flavors of organic watermelon and lemons from the “sails” of a sailboat gliding along a refreshing pink sea. Playing on the free and fanciful memories of summer fun, the bright flavor mirrors the vibrancy of the label with the “Honest” twist of less sugar and fewer calories than similar bottled lemonades. The cheerful and inviting label was designed in-house using the same whimsical style of the four other beverages in the Summer Refreshers lineup. Ardagh Group’s, Glass – North America division has manufactured Honest Tea’s 32 ounce glass bottles since March 2014.